Making a good cup of coffee at home is not hard once you follow a few golden rules. COFFEE Buy whole bean coffee, not more than 30 days old. GRIND YOUR OWN Coffee grinders come in two varieties: blade and burr. Blade grinders chop your coffee into different sizes, while burr grinders are more consistent, producing a more even extraction of flavour. BREW EQUIPMENT There are a variety of good ways to brew your coffee. 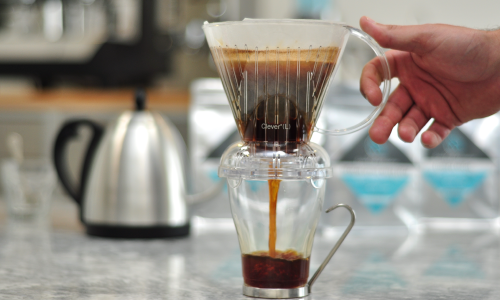 For simple and inexpensive, yet fabulous flavour, pour over such as Clevers or Chemex are great value. If you want to brew more coffee, we recommend the Bonavita brewer. For espresso, check out our range of good equipment on the shop page. TEMPERATURE Coffee should be brewed at 200°F. Pre-heat your vessel with hot water; to avoid heat loss. Weight: 1 gram of coffee to 17 grams of water. Use a scale if you want to be really professional! EXTRACTION TIME Depends on brewing method. French Press 4 minutes while dripper extraction time falls between 2.5-4.5 minutes. GRIND Use a burr grinder to select a grind/particle size appropriate for your brew method. Grind just before brewing. In general, coarser grinds correlate with longer extraction times as with French press and other full immersion brewers. Medium to finer grinds correlate with slightly shorter extraction times as with drippers and the Aeropress. It's best to experiment with your equipment, taste and check for balance of sweetness, flavor clarity, and body without over-extracting and making a bitter, burnt brew. Note these general guidelines are important when brewing. For your particular method, please see our brew guides below.